Lee Kristensen is a product manager at renowned turf equipment manufacturer, Ransomes Jacobsen. 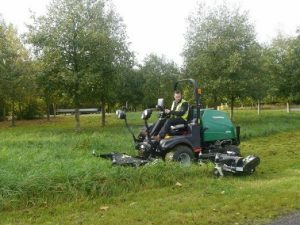 Lee manages the full range of Ransomes ride-on mowers, and is responsible for the development of new products, including the upcoming HM600 flail mower. In this article, Lee discusses the history of the flail mower, and how to get the best out of them in the current climate. The flail, and indeed the method of flail mowing, has a long history with physical references to early flails thought to be found on Tutankhamun’s Coffin. This early use formed one of the fundamental definitions of a flail: an agricultural implement consisting of a pole with a short free-swinging stick, often used to thresh grain. 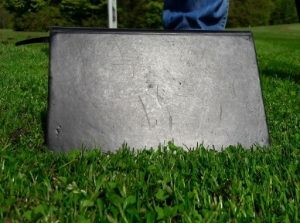 This free-swinging element is a constant as we have moved to modern methods, and is the key to many of its advantages in commercial turfcare. This method of turf maintenance is increasingly common at the finer end of commercial turf grass maintenance while its origins stem from heavier, more agricultural use. The high cut capacity and free swinging, self-protecting blades have a natural position in cutting variable dense long material, often with hidden foreign objects. The blades swing out to provide enough speed and impact force to cut organic material, but are not rigid enough to be immovable when hitting stationary objects. This limits the force absorbed by the powering implement, allowing it to be engineered to a level where it can be a flexible tool. Heavy hammers and chains have been replaced, but the core technology remains the same to be successful at this finer end. 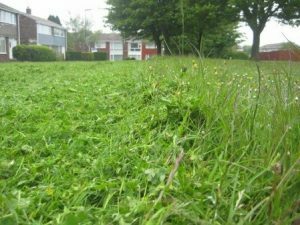 A common problem faced by the commercial grounds maintenance teams of today is the variation of grass and material that must be maintained in one space. It is very common now for areas of a park to left naturalised and only maintained once or twice a year. These are positioned next to high finish areas that are cut regularly. There is then the amenity grass in the middle-ground which is being cut less regularly due to cutbacks. A flail mower can be a real solution to maintain all of these areas with one mower. The historic, free-swinging element is the key to the flails core advantage. However, there are several other advantages that are important to recognise to get the most from a flail mower in all conditions. 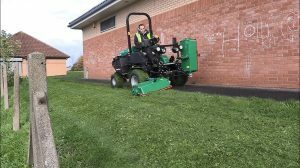 It’s ability to tackle the rougher cuts is well established and often held to less scrutiny, but how do you get the best out of a flail to maintain rougher areas as well as finer turf? The key to the flail’s cut capacity is that it can eject cut material over the entire width of the cutting unit. The intake is as large as the output. When considering a rear discharge rotary mower trying to do the same job, the majority of cut material taken from one sweep of the blade is primarily trying to get ejected through a gap that is only 25% of the intake which, when overloaded, can lead to clogging and balling of grass. Use the flails advantage to take off more material in one pass and always have an evenly spread discharge. Another benefit to the cut capacity is the short distance from where the grass is cut to where it is discharged. Each blade is cutting a section of grass then discharging it without having to travel through uncut material. After a rotary blade cuts the first blades of grass in its path it must travel through the remaining swath of uncut material. This allows a flail to handle tough sections of grass in amongst regular cutting. Use the flails advantage to take out tough growth sections in amongst regular grass and maintain a consistent finish. 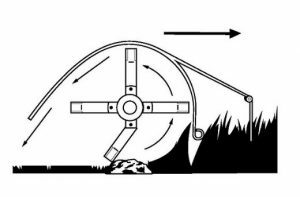 The design of a flail has multiple short, lightweight blades on shaft spinning at a high number of revolutions per minute. This gives the cutting edge the speed it needs to provide the acceptable cut consistency. However, due to vastly reduced blade mass, the impact energy, which is a function of the speed and mass is still typically much less than a rotary. The impact energy is still adequate to cut organic material but when a blade comes into contact with foreign objects, the transferred energy is dramatically reduced. The result should be that any thrown objects ejected don’t travel as far. Use this advantage to gain confidence in safely working in public spaces. 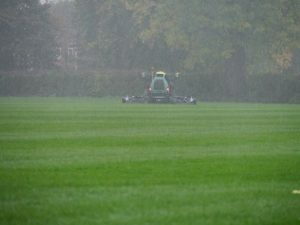 The overall machine weight and traction characteristics will generally dictate what weather conditions you can mow in. However, there will always be some borderline conditions. The airflow through the flail head is much more linear than a rotary. This linear airflow keeps the discharge area clear, self-cleaning the unit. 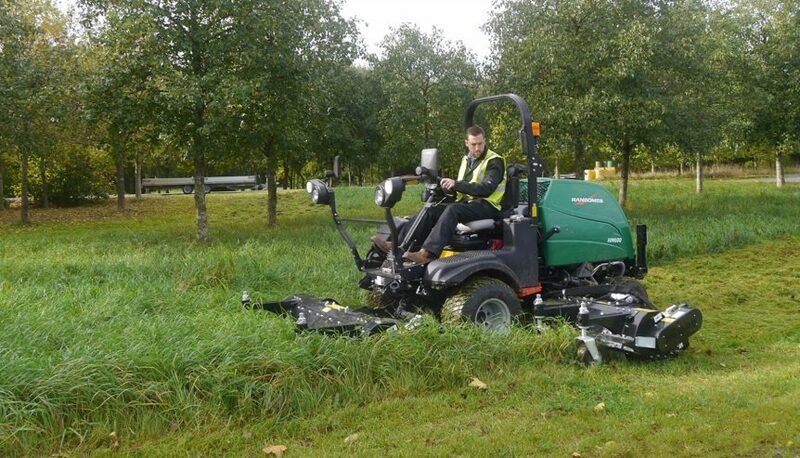 Compared to a rotary which has a more complex airflow with more restricted or trap points that encourage wet clippings to clump and leave an uneven discharge. Use this advantage to try and cut in wetter conditions and leave an acceptable finish over a rotary mower. What’s important as turf get finer? 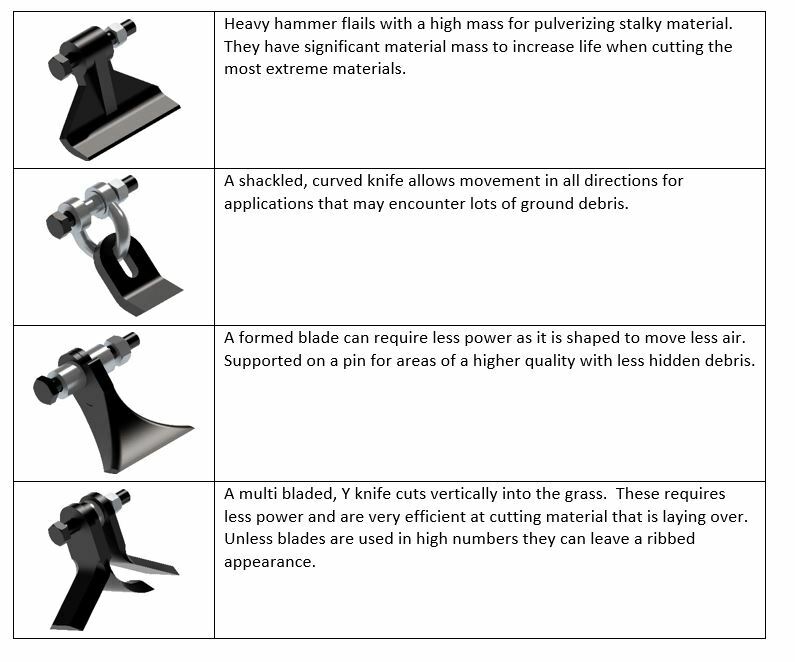 The impact cutting method of a flail needs material to work against when making its cut as there isn’t a stationary bottom blade as found on a cylinder mower. The firmer this supporting material is, the more consistent the cut. To get the best consistency on finer turf a good rule of thumb is to think opposite from the advice often quoted for rotaries. Taking off more than a third of the leaf should be the starting point to ensure you aren’t just brushing over the tips of the grass. Flail mowers can cut with rounded blades, but as conditions get finer it’s evident that cleaner cuts are going to come from sharper edges. If the flail has been more regularly used for rougher maintenance, make sure the blade edges are in good condition to achieve the best results on the finest areas. As the flail moves forward through grass, the blades cut material in an arc at different heights down to the set height of cut. The slower the speed, the more opportunity for cuts and the better the consistency. This is especially important on finer, shorter turf and a reduction in mow speed may go some way to give the desired consistent finish when the blades aren’t in perfect condition or there is not quite enough supporting material to hold up the grass being cut. Remember, if you are already using the core advantages of a flail you are getting results cutting more off, less frequently, in potentially worse weather conditions. A small reduction in speed means you are most likely still on top with productivity and avoid potential double cutting of other methods. Flails by their nature, mulch the grass as it is cut. The Müthing flail system is designed with patented additional shredding teeth to maximise this mulching. These mulched clippings will rot down from the surface faster, bringing back a high level of presentation sooner. The mulched clippings also return more nutrients, evenly over the cut surface compared to a rotary cut. Most flail mowers are supported at the rear by a full width roller. So, if attention is paid to cutting direction you can use rollers to get a professional striped finish, bound to bring in compliments from the public. Ransomes has incorporated these benefits to create the HM600, a new wide area ride-on flail mower using Müthing mulching technology. If maintenance specifications are forced to be modified, explore your options and think about how these benefits could support a new regime. There are many types of this flail blade for different conditions. Typical blade types vary from manufacturer but they follow common principles. less air. Supported on a pin for areas of a higher quality with less hidden debris.